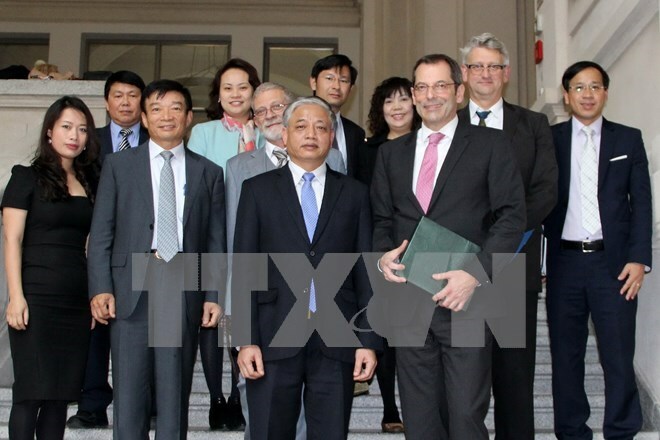 Deputy Minister of Labour, Invalids and Social Affairs Doan Mau Diep met Rainer Sontowski, State Secretary of the German Federal Ministry for Economic Affairs and Energy (BMWi), in Berlin on October 7 to discuss the expansion of the Vietnam-Germany nurse training project. State Secretary Sontowski highly spoke of the outcomes of the pilot project on training Vietnamese pediatric nurses in Germany since 2013 and reaffirmed his ministry’s support to the project. He proposed continuing the joint programme with the addition of training courses for general nurses. He also suggested the two countries foster information exchange and strengthen management on nurse recruitment and training. For his part, Deputy Minister Diep thanked German federal agencies, especially the BMWi and the Federal Enterprises for International Cooperation (GIZ), for their support to Vietnam over the past years. Diep said the pilot programme was successful, and he hoped the project on general nurse training would be implemented soon. During the session, the two sides agreed to mull shortening German language and professional training courses’ length, enabling students to start working earlier. Earlier, Deputy Minister Doan Mau Diep attended the graduation ceremony of the first 94 Vietnamese trainees in Braunschweig city, Niedersachsen state.